Facebook is incentivizing some page administrators with badges for quick responses to messages. Respond to 90 percent of messages with a five-minute response time over one week to receive the indicator. 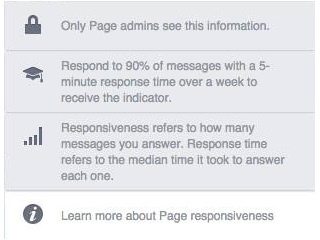 Page admins: How many of you are seeing response rate and response time in your admin panels, and have any of you seen this information about the quick-response indicator? Thank you to Matteo Gamba of TransferWise for the screenshot.